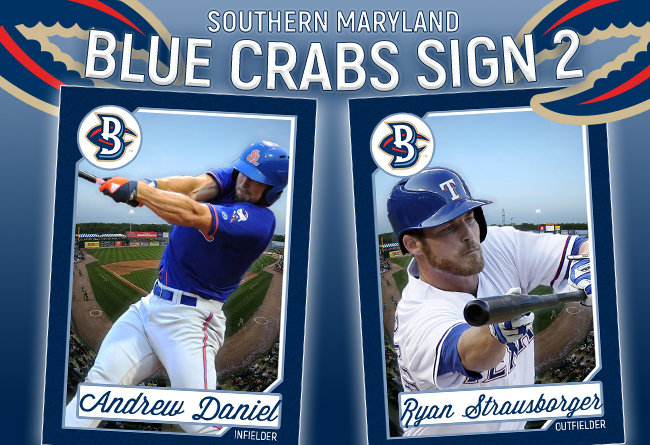 (Waldorf, Md., March 28, 2018) - The Southern Maryland Blue Crabs have added two players to the 2018 roster, former MLB outfielder Ryan Strausborger and infielder Andrew Daniel. The 30-year-old Strausborger comes to the Blue Crabs for his first year in the Atlantic League. Strausborger was originally selected by the Texas Rangers in the 16th round of the 2010 MLB draft. The Indiana State alum had a breakout season in 2011, hitting .270 while leading the Myrtle Beach Pelicans with 31 stolen bases. This led to his selection as a Mid-Season, Post-Season, and MILB Organization All-Star that season. Strausborger continued to climb the ranks of the Rangers organization, eventually breaking through to The Show in 2015. After appearing in 31 games for the Rangers that season, the Indiana native began the next season at the AAA level. He was traded to the Seattle Mariners in July of 2016, before signing as a free agent with the Minnesota Twins in 2017. Across eight professional seasons, Strausborger has posted an 82% stolen base percentage, while averaging over 22 stolen bases per year. Daniel will come to Southern Maryland for his fifth season in professional baseball. The infielder burst onto the national scene in 2012, his freshman year at the University of San Diego. Daniel hit .339 with four homeruns and 45 RBI’s, earning him recognition as a Freshman All-American by Louisville Slugger, NCBWA, and Baseball America. After making back-to-back NCAA Tournament appearances at USD, the California native was selected by the Los Angeles Angels in the 11th round of the 2014 MLB Draft. Daniel hit .340 in his first professional season, earning him Organization All-Star honors. He spent the next 2+ seasons with the Angels organization, before finishing 2017 in the Atlanta Braves system.